Despite the effort from the Monero community at manufacturing a hardware wallet and Ledger implementing Monero into the existing one, it may not be available anytime soon. Because of the lack of HW wallets, storing your coins in a paper wallet is your best and safest option for now. If you already own tens of coins which are currently worth $230 per piece, you may want to reconsider your threat model. Before we start, it's absolutely necessary to make sure your PC isn't infected and is NOT connected to the Internet. A malware could easily steal your mnemonic seed which gives it an unlimited access to your wallet. Please have a look at Rusty's Remarkable Unreliable Guide To Bitcoin Storage first. Most of the guide also applies to Monero. If you don't have GnuPG yet, download it and run the previous gpg command again. You should see something like: gpg: Good signature from "moneromooo-monero <moneromooo-monero@users.noreply.github.com>" [unknown]. Make sure you're OFFLINE before proceeding any further! Please note that I use the folder named "Source" instead of "github". Make sure "MONERO" is selected. You can add custom entropy but for security reasons, it's best if you leave that field empty. When ready, click GENERATE WALLET. A confirmation alert will ask you whether you're sure because the "wallet cannot be recovered once a new wallet is generated". Click yes and scroll down. You'll see 3 fields: public address, mnemonic seed, and private keys. The public address is your wallet address that you want to share with others so they can send you moneroj. You can copy it to a text file for later use. You may also print the QR code. Mnemonic seed is 25 words string that represents a seed that is used to generate private keys and the public address. Mnemonic seed is your backup. If you lose it, you'll never be able to restore your Monero wallet! Make sure to never store the seed and private keys (especially the spend key) on your computer! Instead, write it down on a piece of paper and store it somewhere safe. This step is optional in case you want to store your mnemonic seed on a nicely designed paper. 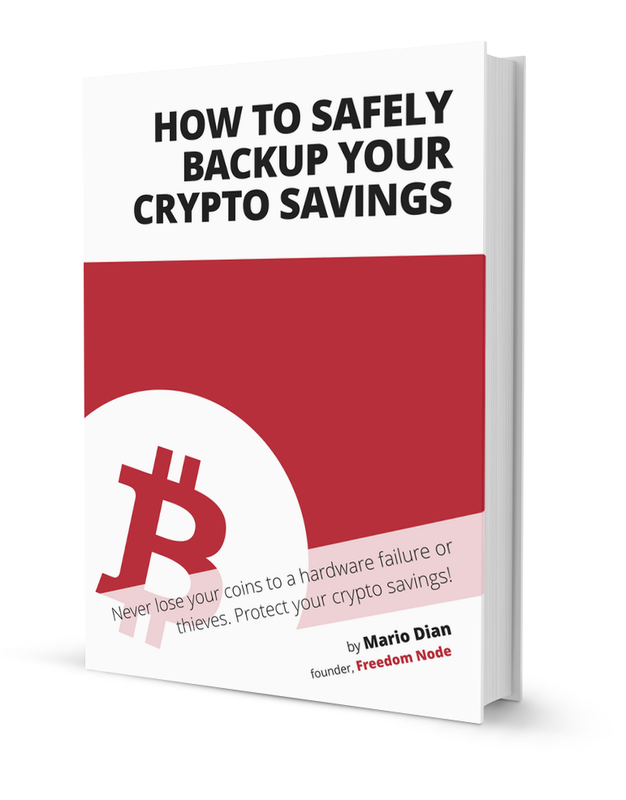 If you download my free e-book, you'll also get a simple paper template to store the seed for Bitcoin and Monero with it. For a fancier version, you may want to have a look at The Monera Art's beautiful wallet design. First, make sure you've downloaded and installed the CLI (command line interface) or GUI (graphical user interface) wallet. There are a couple of light wallets available but let's stick with the official wallet. Please note, that you will only need to restore your wallet when ready to spend your coins. Restoring the wallet but not spending its full content exposes you to the risk of theft - more so if your computer is connected to the Internet. Keep that in mind! Next, specify a new wallet name (for example your name) and then type in the 25 words long mnemonic seed. Optionally, you may want to secure your wallet with a password (recommended). If you aren't running monerod you'll see an error stating that the wallet cannot connect to daemon at localhost. It will take a while until the wallet downloads all the chain data (it will only store a small part of it though). While you're waiting, make sure the "Opened wallet" field matches your wallet public address. Start the monero-wallet-gui and select the language when prompted. On the next screen, click Restore wallet from keys or mnemonic seed. Type in your wallet name and the mnemonic seed from your paper backup. Next, create a new password (optional but recommended) and go to the next step which shows you the wallet's summary. Click USE MONERO to open the wallet. When in the wallet, open the Receive tab and check that the address matches the one that the paper wallet generator created for you. I hope you find the tutorial useful. Let me know in the comments section below if you run into any issues.